There used to be a time when I had to wear pants. Or any sort of clothes in general. I have to remind myself of this as it's 11 am and I'm sitting at the kitchen counter wearing fuzzy slippers, my husband's boxer shorts and a tank top that has a mysterious stain right above my left breast. Of course, I still have to wear clothes every now and then, but I tend to avoid dressing in anything non-pajama related as often as possible. My rule of thumb tends to be that pants (and bra) are only required if I'm going to be forced to interact in a professional manner in any way. This often means I can run to the store wearing slippers and jammie bottoms but will shrug into real people clothes if there is any possibility of seeing the principal of my children's schools. Of course, I play fast and loose with this rule and have been known to appear almost any where in yoga pants and slippers. The fault of this lies directly at the Internet's feet. If it had feet. Which, to my limited understanding, it does not, so maybe it's just everyone who is on the Internet's fault. Y'all are feeding my pant-free addiction. Somehow this blog post became about my pants protestation and the fact I'm a lazy slob. Anyways. I love the Internet because it embraces the pant-less. The Internet seems to love me back too. Or so I tell myself. I used to always tell myself that Jamie G with the green eyes in grade nine loved me back as I was crushing on him. I'd catch him looking at me and construct complex fantasies about how he was working up the courage to ask me out and it turns out, he liked the girl sitting behind me. My point is, (lost and not articulated but whatever) during my vast time on the Internet, I've made some awesome friends. Friends who get me. Who embrace my quirks and love me despite of them. Friends who, much to my husband's dismay, enable my oddities. It only took 454 words for me to get to the point of my post. That must be some type of record. I now feel the need to apologize to each and every one of you who are actually reading this. Back to my (lost and less than articulated) point. I love the Internet and the people that are on it. Because they love me back. How do I know they love me back and aren't just staring at the girl behind me like that dreadful Jamie G with the pretty green eyes in my grade nine class? Well, they occasionally send me things they have seen and know I will appreciate. 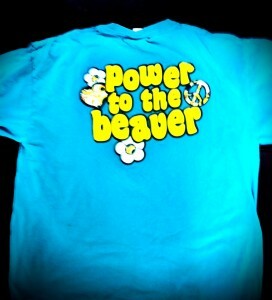 Everyone needs a tee shirt like this. Special points when you wear it while picking your children up from their high school while wearing slippers and sporting pigtails. Everyone should have a friend like Rachel from A Southern Fairytale. 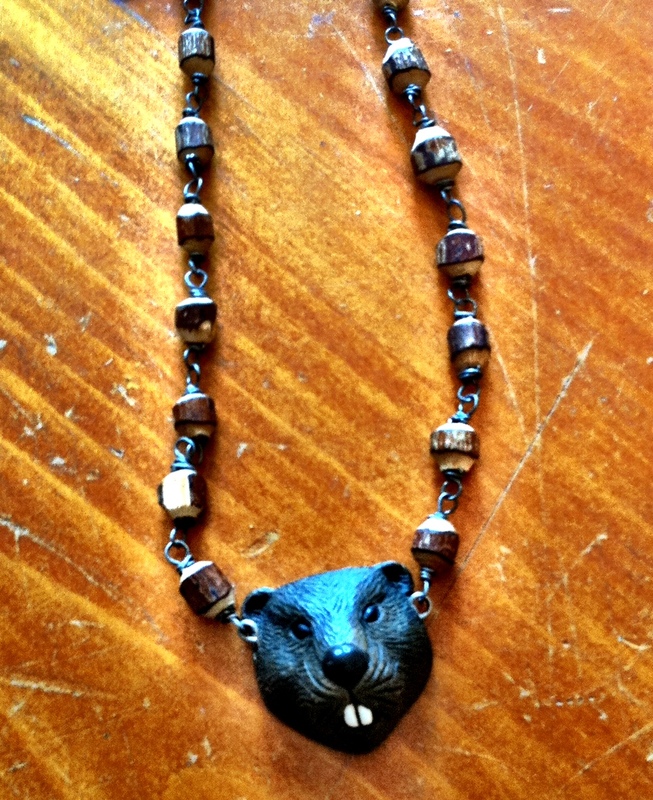 A beaver necklace. Complete with gnawed on log beads. Pure awesome. My friend Vicki from Sharp-Tongued Mom saw this on Etsy and knew my life wouldn't be complete without it. She was right. 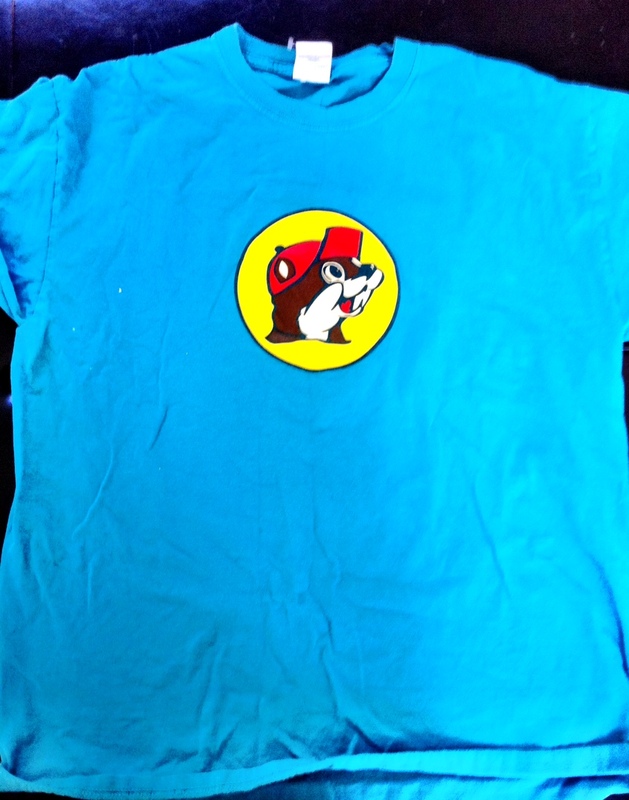 I wore it all weekend long and I swear it gave me super powers. Or so it felt like, because every time my mom looked at me and saw it hanging around my neck she winced. She couldn't stand the awesome. So ya, I spend too much time on the Internet, generally while pant less, screwing around instead of working. But it all works out in the end because of the beavers. The beaver is a proud and noble animal. No matter what my mother thinks. Now if only Klout would recognize my leading authority in all things beaver, the net would be darn near perfect.